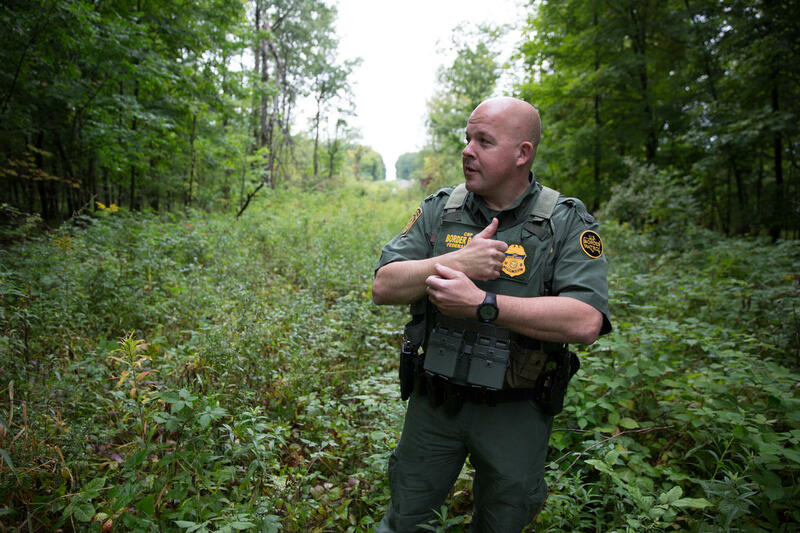 The Swanton sector of U.S. Border Patrol covers nearly 300 miles of the U.S.-Canada border, including parts of New York and all of Vermont and New Hampshire. Some civil rights advocates have raised concerns that U.S. Border Patrol may be infringing on people's civil rights as it carries out stops in its vast jurisdiction. Within 100 miles of the border and the coastline, U.S. Border Patrol agents have broad authority to stop cars and people for immigration questions. For example, over the past few months the agency has set up checkpoints in New Hampshire, stopping hundreds of cars and arresting more than two dozen undocumented immigrants. On a recent drizzly morning, U.S. Border Patrol Agent Brad Brant took me and another journalist along the U.S.-Canada border to see areas where they've apprehended human smugglers and drug traffickers. The first stop is a place along the Canadian border in Highgate, Vermont, that agents have nicknamed the "tree farm" because there's a maple sugaring operation there. "What we'll have is people will come here and either pick up people that have walked into the U.S., or they'll drop off people that will to walk into Canada through here, because it's about a 10 to 15 minute walk to the border," Brant says. And the location is just a stone's throw to Interstate 89. "If they get picked up on the interstate, they're about four-and-a-half hours from Boston. We don’t have a lot of time to intercept an event like that," Brant says. This area is covered by a border patrol office in Swanton, Vermont. They patrol a stretch of the northern border from upstate New York through Vermont and all the way to New Hampshire’s border with Maine. That’s 295 miles of dense woods, farmland, roads and lakes. In their work along the 100-mile zone along the border, U.S. Border Patrol agents serve multiple roles: They work as immigration agents, they work with U.S. Immigration and Customs Enforcement, they set up checkpoints. And frequently they also serve as backup for local police. The Swanton sector apprehended around 300 people last year, though only about 40 percent of those cases were ever brought to court. Back in the patrol car, we head over to another backcountry road where sometimes people attempt to sneak over the border. "What we're looking for, in general, up here is just something that doesn't belong," Brant says. "The guys come out here and they work, and they get to know the area and the people that live in it and what they do and when they do it, and they basically are patrolling for something that doesn't fit the pattern that they know of, and that's worth a second look." But just what — and who — is worth a second look raises some red flags for civil rights advocates, particularly the farther one gets from the physical border. 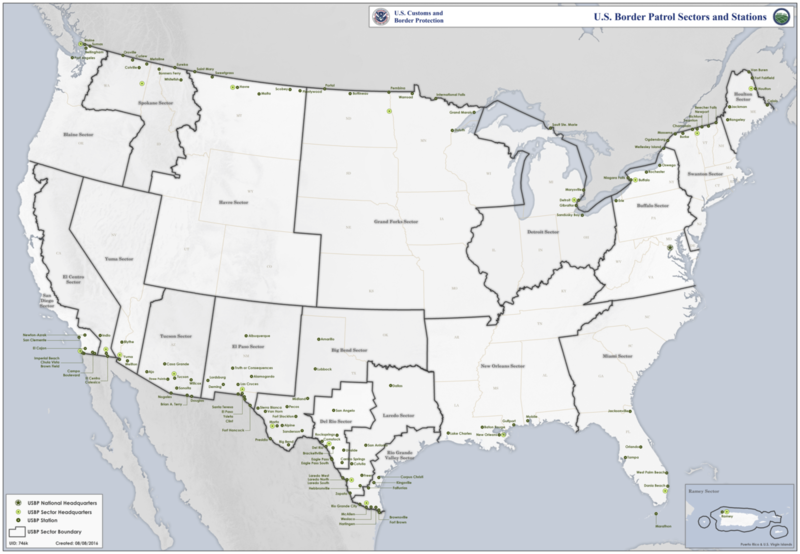 U.S. Border Patrol can stop and question any car or person within 100 air miles of the border, including 100 miles from the coastline. So nearly two-thirds of the U.S. population falls under U.S. Border Patrol jurisdiction — and that includes basically all of New England. Unlike local law enforcement, U.S. Border Patrol agents can pull over a vehicle if they have reasonable suspicion its occupants are of "illegal alienage" — that basically means someone who is in the country illegally. I asked Brant how agents could determine “illegal alienage” without racial profiling? "We're not allowed to do racial profiling, so we use, we develop articulable facts," Brant says. "You know I have 18 years doing this, so I can kind of tell, regardless of somebody's race, whether or not they're — I can look at you, the way you're dressed, the way you act, the way you walk; you're probably from Vermont," he says. "If you were dressed a lot differently, that didn't fit in, that would be an articulable fact." But James Lyall, executive director of the ACLU of Vermont, says these descriptions alone — without other evidence — wouldn't hold up in court. "None of those things by themselves would constitute reasonable suspicion of alienage," says Lyall. The ACLU has documented repeat instances of racial profiling occurring, specifically in Arizona and along the southern border where it's done extensive research. But when it comes down to it, even the courts aren't clear on whether race can be used as a factor for stopping a person. "It's not a settled issue. It's one that's hotly contested," says Lyall. "There's actually conflicting circuit law on whether agents can even consider race in making stops, or whether that's racial profiling." Earlier this spring, two dairy farm workers were returning home to their farm after an activist event when their car was pulled over. The car had Vermont plates, and was not pulled over for any traffic violations. It was pulled over because an agent suspected the occupants were not legal U.S. residents. The two workers were Mexican nationals who were residing in the U.S. undocumented, so they were arrested and handed over to ICE. However U.S. Border Patrol wouldn’t reveal what evidence led them to believe the car contained foreign nationals. "I can't really tell you the specifics on how the reasonable suspicion of illegal alienage was developed, but they were coming on a road that approaches the international border ... in the area of East Franklin," Brant said, speaking about the arrests back in June. Even the way a recent U.S. Customs and Border Protection policy description explains when race and ethnicity can be used leaves much open to individual interpretation. The Aug. 10, 2017 policy description walks a fuzzy line, saying racial profiling is not allowed — but an agent could use race and nationality as an indicator in certain situations. "CBP has on its website what it will be looking at, and it does say that again they want to not use racial profiling, but it then goes on to say that some of these things might be indicators," says Leslie Holman, an immigration attorney in Vermont, and former president of the American Immigration Lawyers Association. Holman says the priorities of the presidential administration weigh heavily on just how these nuances are interpreted. "And CBP doesn't operate on its own, but they are given direction from the administration," Holman says. U.S Border Patrol won’t say whether they have been given new directives by the Trump administration. Steven Cribby of the Swanton sector wrote via email that "U.S. Border Patrol priorities and guidance are driven by the administration and we carry those out locally as directed." But there have been sweeping policy changes for ICE, memos directing that agency to prioritize the deportation of any undocumented person in the United States. "The fact that the agency doesn’t collect data on its own operations, which is a standard law enforcement practice — Vermont police collect extensive data on stops and searches — why is it that the largest law enforcement agency in the country, CBP, can't do same?" Lyall says. But even assuming U.S. Border Patrol agents aren't racially profiling most of the time, just the perception that they are can be damaging to communities that fall within their jurisdiction. Holman says in light of national policy and rhetoric, there is grave fear among immigrant communities— including people who are living legally in the U.S.
"And what is the ultimate effect of that? I mean, it can be horrible," Holman says. "People won't go to the police if they’re victims of a crime. 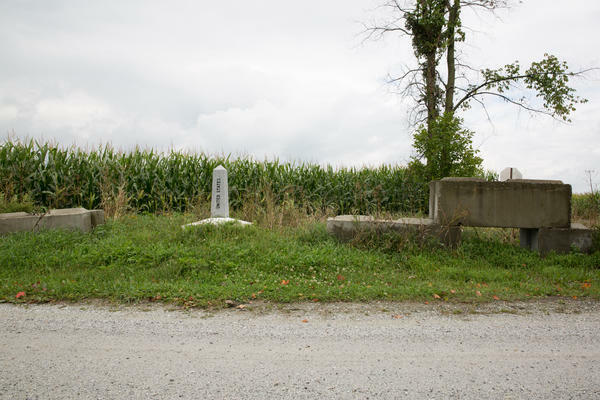 They may not seek medical care, they may not do things that they should doing for their own safety or that benefit the community, which is an ultimate loss to us." Communities inland from the border are already feeling the presence of U.S. Border Patrol. In recent months, checkpoints set up in New Hampshire stopped hundreds of residents. At a recent checkpoint in Lincoln, New Hampshire, more than two dozen immigrants were arrested, including students from a Massachusetts charter school. The U.S. Border Patrol has said it plans on using more checkpoints in northern New England in the future. 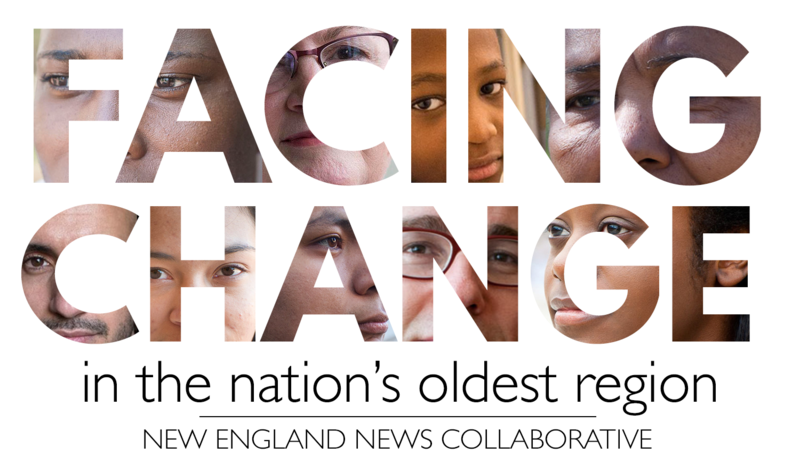 This report is part of a series called "Facing Change," which examines the shifting demographics of the region. It comes from the New England News Collaborative, eight public media companies coming together to tell the story of a changing region, with support from the Corporation for Public Broadcasting.